Given that a long train trip can be one of the most soothing and romantic ways to get from one place to another, it's no wonder that train travel is surging in popularity. On a train, you have time to relax, read a book or listen to music, and chat with your traveling companions. Best of all, you'll get a view of the passing scenery, which isn't possible from an airplane window. To get the most out of your rail journey, follow a few basic rules. A train trip should be booked as far in advance as possible - six months or more is not unusual. This is particularly true if you want sleeping car accommodations. Sleeping cars are expensive, but well worth it if you're going to spend one or more nights on the train. Even if your budget is tight, and you don't mind sleeping in a coach seat, you'll still need a reservation. Most long-distance trains offer checked luggage service. This will likely be mandatory, since there's no storage space for large bags in either sleeping compartments or coach cars. If you want to bring along large pieces of luggage like a guitar, surfboard or skis, it's wise to check the carrier's policy before you go. Pack all necessary toiletries and medications in a small overnight bag. Sleeping car passengers generally have meals included in their fares, and get preference for dining car seating. If you're traveling in coach, you'll have the option of purchasing food in the dining car or bringing it on board with you. Dining car prices are similar to mid-range restaurants; there is usually a café or bar car as well. It's a good idea to travel with some bottled water and snacks, along with food that will accommodate any dietary restrictions you may have. Check the policy before you book. Amtrak allows sleeping car passengers to cancel 15 or more days before departure, but a refund fee applies; conditions vary for those in coach. Canada's Via Rail has different policies depending on the discount level of the ticket. While you can travel almost anywhere throughout the United States and abroad by railway, there are a few notable routes that have, in part, caused the current popularity of train travel. Lake Shore Limited (New York-Chicago) and the Sunset Limited (New Orleans-Los Angeles) offer long distance travel to train passengers. The most legendary Amtrak route is the California Zephyr, which leaves Chicago at 2 p.m. on Day 1 and arrives in Emeryville, outside San Francisco, at 4:10 p.m. on Day 3. Along the way, the train passes scenery such as the Sierra Nevada and Rocky Mountains, Donner Lake and the Feather River Canyon. The Zephyr features a sightseeing lounge and an on-board guide program. When traveling in the Golden State, don't miss the Coast Starlight, which goes from Seattle to Los Angeles in 35 hours. The train hugs the coast for part of the trip, and offers amenities such as a nightly wine and cheese tasting in the Pacific Parlor Car. Want to bring your car along? Take the Auto Train from Lorton, Virginia (just outside Washington, D.C.) to Sanford, Florida (near Orlando). Regardless of class of service, passengers receive complimentary dinner and breakfast, enjoy movies in the lounge, and avoid 900 miles of driving. Via Rail's most celebrated train is The Canadian, which travels between Toronto and Vancouver in both directions. The trip takes three days and four nights, passing through Winnipeg, Saskatoon, Edmonton and Jasper along the way. Passengers may travel straight through, or stop by prearrangement. Another enticing option is The Ocean, which makes the overnight trip from Montreal to Halifax along the St. Lawrence River. Venice Simplon-Orient-Express: One of the world's most celebrated journeys, the VSOE carries passengers in beautifully-restored, antique sleeping cars and provides elegant, black-tie dining. Trips begin in London and end in Paris, Venice or Istanbul. The Royal Scotsman and England's Northern Belle, operated by the same company, offer similar amenities. Blue Train: Running between Pretoria and Cape Town, the luxury suites of the Blue Train include bathrooms, TVs, and butlers who are on call 24 hours per day. Rovos Rail gives passengers a similar experience along the same route. Golden Eagle Trans-Siberian Express: The world's longest rail journey covers more than 6,000 miles, from Moscow to Vladivostok, in extreme comfort. Passengers travel past Lake Baikal, through the Ural Mountains, and visit Ulan Bataar, the capital of Mongolia. If you're on a budget, there are a number of ways to save money on fares. Amtrak's Smart Fares offer discounts up to 25%, and are available on their website Tuesday through Friday. If you want to visit multiple destinations in a short time, Amtrak offers rail passes for periods of 15, 30 or 45 days. This will allow you to pay one price to travel by train during the designated time period, as often as you'd like. Amtrak also has a Guest Rewards program for frequent travelers, which allows passengers to earn points and redeem them for future trips. Via Rail features a range of discounted fares and rail passes, as well as Via Preference, their frequent traveler program. 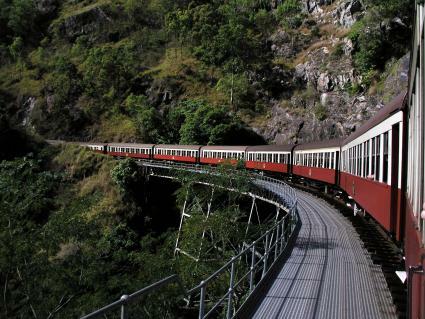 All you really need to experience a great rail journey is time. A long train ride will allow you to rediscover the real joy of travel, and realize that the journey is just as important as the destination.